Walter Bedell Smith was born in 1895 and graduated from the Army War College in 1937. He is regarded as an important war general who worked as Dwight D. Eisenhower’s Chief of Staff in all of his European commands and who maintained a strong foothold in foreign policy after World War II, becoming the extremely important American Ambassador to the Soviet Union, director of the Central Intelligence Agency, and Undersecretary of State under Eisenhower (source: Command and General Staff College). Smith served as Eisenhower’s Chief of Staff in his European Theater Operation in 1945, an important job that, for Smith, was mainly characterized by receiving and sending messages to and from Eisenhower, however it also entailed negotiating Italy and Germany’s surrenders. Working closely with Eisenhower led Smith to the White House after the war (and after he served as director of the CIA, in 1953), where then-President Eisenhower appointed him Undersecretary of State. Smith envied the Secretary of State—a title he had wanted for years—but nevertheless performed his job well, forging a better relationship with the Soviet Union and Korea. 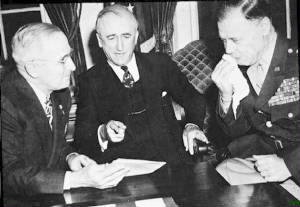 Smith’s role as the American Ambassador to the Soviet Union became important as tensions between the U.S. and the Soviet Union mounted after World War II. Walter Bedell Smith became the director of the Central Intelligence Agency from 1950 to 1953, during which time he was mostly well regarded. His accredited “with applying a firm grip on CIA, and with establishing effective command and control over the organization by clarifying the DCI [Director of Central Intelligence]'s authority” (source: Muskingum University). However, relatively recent documents from the Cold War, as reported by The New York Times, show that his few failures often go unnoticed. Among them include his decision to remain idle on the issue of the imminent war against Korea. “Despite a buildup of North Korean troops along the 38th parallel . . . Gen. Walter Bedell Smith said an invasion of South Korea by North Korea had been put off in favor of a campaign of propaganda and subversion,” the Times reports in its 1993 article about Smith. This mistake led America to lose upwards of 50,000 soldiers in Korea and prompted a full-on war that drove the Korean forces from the very north of the country to the very south, and finally to the 38th Parallel, where the border between North and South Korea remains today. Smith died in 1961 and is buried at Arlington National Cemetery in Arlington, Virginia.